While Ostara (also called Eostre and Eastre) is the Germanic goddess of spring and dawn, there appears to be no equivalent Germanic god of spring. 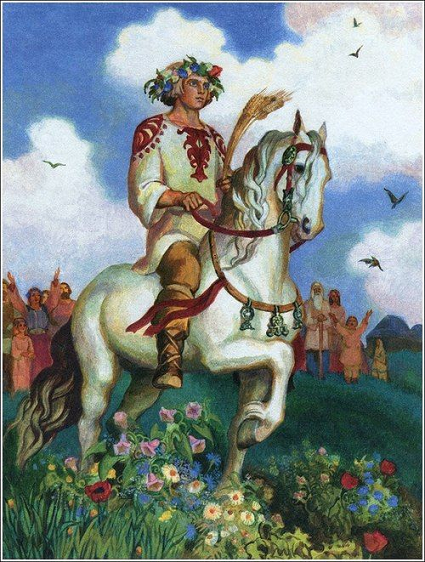 There is, however, a handsome, young Slavic god of spring and fertility – Jarilo. He was born on the night of the Slavic new year and was the tenth son of Perun, the god of thunder. Veles, the Slavic god of the Underworld, kidnapped Jarilo from his cradle. As a result, winter overtook the land. Vegetation died and fertility was suspended. Jarilo escaped, arriving home in spring at which time flowers bloomed, birds sang and fertility festivals (some called them orgies) were held. Each year the cycle of death and rebirth repeats, much like it does with the goddess Persephone. Each spring Jarilo returns on a white horse, celebrating the sun’s resurrection, so he was also considered a sun god. He was the god of vegetation, too, because he enabled crops to grow, protecting and defending them from natural disasters. Besides temples, Jarilo’s places were rivers, forests and cemeteries. The month with which he is associated began March 21, when the sun entered the sign of Aries. For that reason, a ram was often sacrificed in his honor on the equinox. As that story goes, when she found out her brother/husband was unfaithful, she gathered the gods and together they murder Jarilo, dismembering him in a ritualistic sacrifice and forcing him back into the underworld. Marzanna becomes heartbroken and cruel. The cycle of death and rebirth allows Jarilo to meet, marry, and be dismembered by his sister year after year. This Ostara, if you wish to call a god into your circle, Jarilo is one option. You could try putting an olive branch and a sword on your altar. You might also use a symbol of Aries or a ram, branches, flowers and other signs of spring. If you would like a goddess from the same pantheon for your sabbat, get to know Kostroma, the East Slavic goddess of fertility and fruitfulness. In mythology, she was the one that provides fertility and abundance of land, invoked every spring through various rituals. Kostroma brings those born on this day a special talent in writing and speaking. Kostroma is also the goddess of signs and coincidences, according to “The World of Ancient Gods – Slavic Goddesses” on Meet the Slavs’ website. As Spring approaches and we find ourselves at another turn of the Great Wheel, opportunity abounds for making deeper connection to the natural world and Gaia’s greening of it. Gaia is seen as the maiden offering the promise of new life in a womb that is still developing and preparing for what will be birthed in full glory as the summer approaches and the peak of all living things is held in father sun’s gentle hold. It is Her sweet breath that breathes life into what lay in wait to be birthed and it is Her gentle hand that guides the process of renewal. This time of reaffirming fertility and its progeny of new life marks the Spring Equinox. What was weighted more heavily at the time of the Solstice has now achieved a certain state of balance and equilibrium, before it seesaws once again towards one polarity’s weight. As we look around at our earthly world we can marvel at the cyclical nature of new life, maturity and the eventual harvesting and clearing which renders the ground fallow as quickening awaits its rhythmic cue. We have emerged from Winter’s hold of stillness and illusory death and now stand at the time of balance and the drawing together of what was and what will be in an organized and synthesized manner so that the promise of newly created life may flourish. Visually, Spring is the time of donning new color, shape and form. Gaia offers up the splendor of her multi-colored cloak as all manner of life bursts forth in texture and hue. The energy of this palette enlivens our being and the call to warmer air and out of doors activities entices even the most reluctant homebody. As life blooms all around you, how will you answer the call to take up the robes of nature’s finery? Where will you invest your energy in renewing what has lain dormant awaiting the gentle push of Gaia’s hand? Will you dare to step into the mantle of the Goddess that she has lovingly crafted for you and claim your place as co-creator in the greening of the world? Take a deep breath inhaling and allow the rhythm of your breathing to establish a gentle and regular pace. As you deepen into this relaxed state you shift your awareness to your inner screen. As you sit as observer you see a veil of pale violet mist form in front of you and as it parts you see yourself sleeping peacefully as the energy of the space builds around you. As you turn greater awareness to this sleeping image of yourself you merge to become one with it and are now the active participant. You awaken to find yourself in the middle of a dense and green forest just prior to dawn. You stretch and extend, feeling the cobwebs of restriction opening and giving way. The potent smell of earth fills your nostrils and the soaking heaviness of moisture fills your being as you drink thirstily. You sense that it is dawn and sunlight filters through tree branches in slender slivers of thread as beads of dew sparkle like small diamonds strung upon the finest silk. You sit up and pull yourself up to standing, again stretching and reaching upwards with breath coming in long deep inhales and exhales. You take a few steps forward and the soft ground below gives ever so slightly under weight of your foot. Your senses are keen and alert and it seems that you can feel every granule of dirt and leave and stone underfoot, despite the padded soles of your shoes. As you move forward, the light grows brighter with each step and you find yourself in a clearing. The ground is still covered in a light bed of thin mossy green and patches of dried grass and you know that this field will be full of flowers and butterflies in just a few weeks. This image flashes quickly before you and then returns to the space of fertile ground that will soon peak. You close your eyes for a moment and feel the last nip of winter’s cold air pass over you, quickly followed by a warm breeze that is light and airy. You open your eyes and see a few yards ahead of you the form of what appears to be a young girl. The sun is directly behind her and flashes brightly in your eyes, making clear definition difficult. You see that she is approaching you and you take a few steps forward in greeting to meet her. As you move closer, you now have the impression that this form is not what you thought. There is resemblance to human form, but the energy and lightness of its quality seem otherworldly. As you move closer still you can now discern that this shape of a young woman is the movement and gentle breeze of seed, earth, and leafy grass moving and swirling. You stop and your eyes follow the path of this unusual sight. Every area of the field it touches responds with the bursting forth of small shoots of flower and fragrant grass. Every area it passes over transforms into haven and home for bee, blossom and butterfly. The fragrant breath of tiny buds wafts delicately in the air and the gentle shape of this breezy maiden of flora moves with focus and precision. You close your eyes and simply rest in this energy of renewal and growth. You feel a gust of wind surround around and know that this maiden of Spring is now enfolding you in her transformative embrace. You feel the movement of her gentle breath clearing away the debris of what has lingered too long and is not of your best interest. You smell the fragrant and fertile earth of planting that is awakening the seeds of potential within you. And, you feel the weight of her cloak of greening as it presses against your skin reminding you that you too are part of this cycle of new growth. You open your eyes and look down at the beauty of the mantle she has placed about you. Tiny leaf and budding flower are woven into a tapestry of vine and slender root. The smell of new verdant life is intoxication and you revel in the finery that Gaia has gifted you with. You feel the gentle kiss of a butterfly’s wing, fresh from the slumber of its cocoon and you know that another turn of the sacred wheel has been rendered. You take a deep breath in, filling your lungs with the freshness of a Spring day’s promise and as you exhale, the cloak falls away and you are once again standing in the open clearing that has yet to be birthed from Spring’s womb. You sigh into a deep exhale, knowing that the greening will occur as it has every cycle and that you will be active participant in welcoming the warming tides. A single stream of air encircles you and you know this is the blessing of Gaia and the promise of her transformative magick. As these thoughts flood through you, a violet mist forms around you and the landscape gently fades from your sight. You become aware once again of your inner screen and pull that awareness back into the sensations of your physical state. Each breath of inhalation draws the energy of the space in which you are sitting back to your conscious awareness. And, each exhalation brings focus back to the gentle and easy rhythm of your breath. Continue in this manner for several more breaths, and when you are ready, gently flutter your eyes open and be fully present and enlivened by Gaia’s Mantle.